Castelmagno cheese is one of Piemonte’s most unique and esteemed cheeses. This DOP cheese (Protected Designation of Origin) can only be produced in three municipalities in the province of Cuneo. Strong, but pleasant and aromatic, this cheese is a popular table cheese and is also used in many Piemonte dishes. 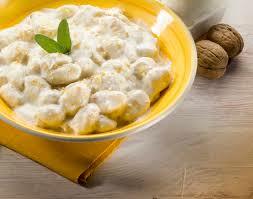 Gnocchi with Castelmagno is probably the most popular recipe featuring it. This is a typical recipe from the cuisine of Occitania. The Castelmagno is a very old cheese which was already famous at the time of Charlemagne. Wash the potatoes and place them in a pot covering them with cold water and leave them to cook for about 25 minutes. Once cooked, drain the water and run them briefly under cold water before peeling them. Once they have cooled off a little, place them on a flat surface and start crushing them with the back of a fork or with a potato masher. Place the mashed potatoes in a bowl and add salt, pepper, the yolks and almost all the flour, about 200g. Knead the dough and let it rest for a few minutes. Roll the dough into small snakes through a handful of flour then cut the snakes into 2 cm pieces. Place a large pan water on the stove and while you wait for it to boil place the Castelmagno into a pan with the double cream and butter and let it melt over a low flame. When the water is boiling put the gnocchi into the water and take them out as soon as they surface. Place them directly in the pan with the melted cheese cream and stir for a minute. If you do not have time to make your own gnocchi you can of course buy them ready made. Find lots of other cheese recipes on our blog such us “Gorgonzola Dolce and Walnut Crêpes“. Enjoy and let us know what you thought! !